I tend to wake up quite early and my idea of luxury is to make a hot drink, return to bed and read the newspapers, emails and Facebook on my iPad. The times I have spotted a recipe whilst lying in bed and have decided to cook it as soon as I got up, and this was no exception. Another Jamie Oliver Sunday breakfast and I had all the ingredients in the kitchen. 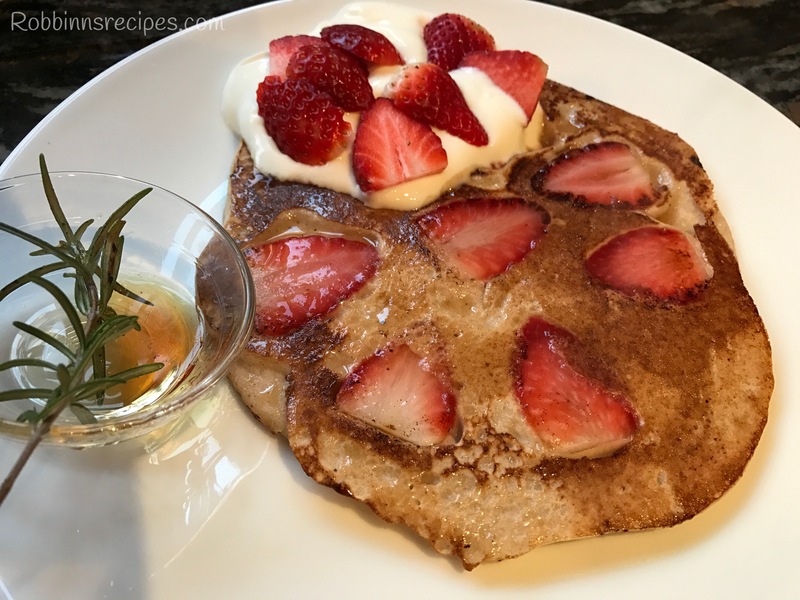 I love pancakes and make a few different types, my favourite being Banana Buckwheat pancakes but these strawberry ones are really delicious and very filling. They have a more ‘meaty’ texture than the fluffy egg ones and certainly fill a gap on a cold Sunday morning. The idea of brushing them with a ‘rosemary’ branch is fantastic. The maple syrup has a wonderful light taste of this delicious herb. Mind you, I had to shake the frost off my rosemary branch as we had a -8° overnight in Camberley which is unusual for us. Put milk, almonds, flours, baking powder, extract and banana into a blender and blitz until smooth. This makes quite a thick batter. Heat a small amount of oil in a non-stick pan and pour in some batter to make an approximate 7” round pancake. Spread out with the back of a spoon. Immediately top with strawberry slices. Cook for a couple of minutes until the base has browned and then flip over and carry on cooking for another minute or two until the second side is cooked. Turn back over and brush the strawberry side with maple syrup using a ‘rosemary’ brush. Serve with natural yoghurt and extra strawberry slices. 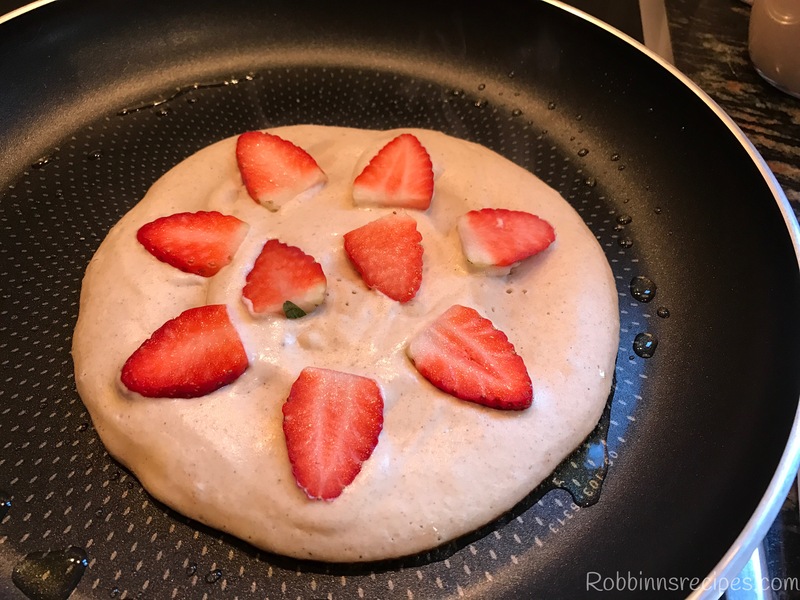 This entry was posted in Breakfast, Brunch and tagged Almond, Banana, Breakfast, Buckwheat Flour, Gluten Free, Healthy Eating, Pancakes, Probiotic Yoghurt, Strawberries, Vegetarian, Wheat-Free. Bookmark the permalink. These pancakes look so beautiful and delicious!